Our year at Kpong Airfield…. Well I just wanted to keep everyone updated with all that has been happening here since we have announced that we are opening our new Builder Assist Center near the Zenith Factory in Mexico, MO. Merry Christmas and Happy New Years to all Zenith builders and pilots. Merry Christmas from everyone at Flight Crafters! All the guys at Flight Crafters wish everyone a Merry Christmas and a Happy New Year! Thank you to all our clients you brought their airplanes to us this year. This year we assisted with the structural modifications to seven Zodiac XL's and we had seven builders take advantage of the CH750 Quick Build Program. In addition, other makes of aircraft participated in our builder assistance program. We will keep you posted on their progress. New Zenith Builder Assist Center to open near the factory in Mexico, MO. We spoke with so many of you both at the Zenith Workshops and at their Annual Open Hangar Day this year that I wanted to update you with what’s happening with our New Builder Assist Center. It’s been unusually cold here in Missouri, home of Zenith Aircraft. The temperature this past weekend was 1 with the high of 12. Not exactly the best weather to be out in the garage building on your project. I've just returned from a short trip to Brazil to visit the Zenith Aircraft dealer AVIAÇÃO Brasileira Ltda. Phase 2 of the build began this weekend with the arrival of the next two kits: the Horizontal Tail kit, and the Slats and Flaperons kit. 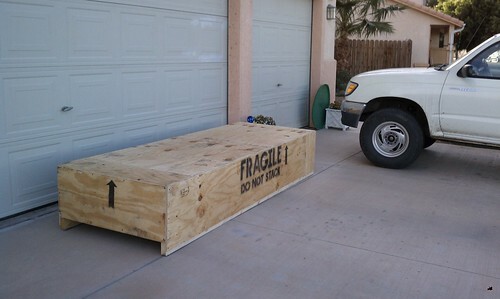 Even though I knew how big the parts were I hadn't really been prepared for the size of the crate; that thing was huge! I can't begin to immagine the wings or fuselage crates. The summer flying is over, the lawn mowing is done, the garden veggies are in the freezer and the leaves are raked and hauled away. Winter is setting in once more in Pennsylvania so its time to tuck my 701 safely away. I then came across a problem - my home made bending brake is only about 1300mm long, and the spar is 2220. However, by taking it slowly and bending a few degrees at a time along the length, I got both edges done. Looking forward to forming the stabilizer ribs and putting it all together. Have ordered an IO233 for $23K due in 60 days. Is anyone out there also going with this engine? Would like to share in the design of this installation. It appears the fuel tank is sitting on the lower skin, cushioned only by cork strips. Am I missing something here??? Thanks for any replies.